If you haven’t seen it yet, run don’t walk (or better yet dance) to see La La Land. It’s a salve for the modern soul. And Lord knows we could use that these days. On the surface, it’s the story of an aspiring young actress and a struggling jazz musician as they meet and fall in love in modern day Los Angeles. One filmmaker’s tribute to the classic musicals of Hollywood’s golden age. For my money at least, it’s a love story to life. You’ve heard the story before, hundreds of times, only the characters and settings ever really change. But really they love each other. They realize they are in love. Something happens to keep them apart. It’s the story of every musical and every romantic comedy ever filmed. But the reason it works every time, the reason we watch it over and over again, is that it’s really the story of our lives. Our journey from birth to death. From self-realization to self-actualization. If your eyes are glazing over, hang with me. This story has a happy ending as well. In 1943 Abraham Maslow stated that people are all motivated to fulfill certain needs. Some needs take precedence over others. These are our basic needs. 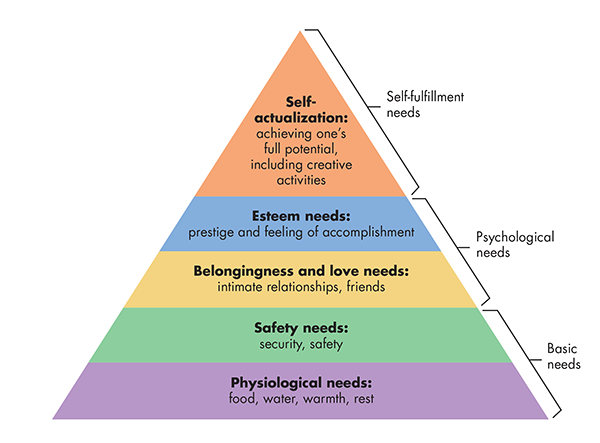 Until these basic needs are satisfied, we aren’t able to fulfill our higher needs. This is illustrated in the chart below. The lower level needs are sometimes referred to as deficiency needs. In other words, they motivate people when they are unmet. And the longer they are unmet, the stronger the need becomes. Just try going a day without food and see what becomes of your mental state. However, once the deficiency goes away, the need goes away. Then you can move on to higher level desires. The highest level of needs are growth needs. Growth needs are different. They actually become stronger as they are met. Self-actualized people are able to look beyond themselves and help others achieve self-actualization. Felling a bit inferior at this point? Don’t worry. Maslow estimated that only 2% of people ever become fully self-actualized. If only for a few moments, Maria reaches self-actualization. Complete joy, complete happiness, complete freedom. I would argue not. Just as there are different levels of needs, there are different levels of freedom. What if running, skipping, dancing and singing across a mountaintop is an illustration of only the most basic type of freedom? A deficient freedom. A freedom from something. Now, that isn’t to take away from Maria’s freedom. It’s a freedom we crave. It’s a freedom we need. But’s only the first step. Complete freedom, transcendent freedom isn’t found on the ground at all. It’s found in the air. 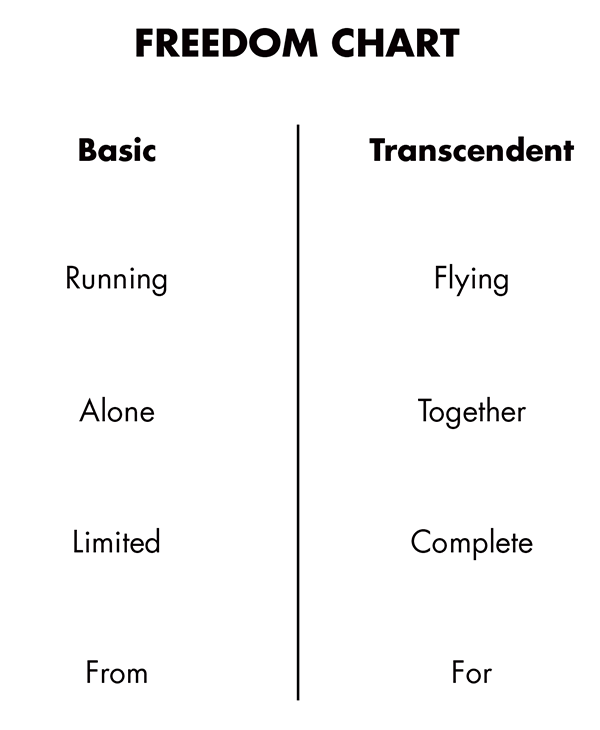 Transcendent freedom is flight. Unbound by even gravity. Basic freedom is defined by our circumstances. We are free when we can go where we want and do what we want. When no one or no thing can stop us. We control our own destiny. Ever met a teenager? They want basic freedom. And with it they learn to test themselves and their limitations. They start to see what they are capable of. Basic freedom does not and cannot bring happiness however. Because basic freedom is defined by what we are free from. Once we attain that freedom, then what? Once we have that freedom we see that it isn’t really freedom at all. Because once the restraint is removed, the very definition of freedom goes away. We are free, but we are empty. Complete freedom, transcendent freedom is a freedom for something. It’s a freedom that allows us to reach higher than we ever though possible. A freedom that allows us to become people that we never though possible. To go places we’ve never dreamed of. We are free and we are fulfilled. Ironically, this transcendent freedom is rarely something we can obtain ourselves. We need help. To use our earlier metaphor, we need a plane in order to fly. And we need lessons to fly that plane. When we fully and completely give ourselves to another, then we can leave the ground. Perhaps this is what the Apostle Paul means when he speaks of becoming slaves to Christ so that we might be free? Could it be that willingly giving yourself fully to someone or something is the pathway to true freedom? Do you have someone in your life that is teaching you how to fly? Someone who doesn’t hold you back, but lifts you up? Are you the engine for someone else’s freedom? Or are you stuck on the ground? Does taking care of the basic needs of life require all your energy right now? Self-actualization? Hell, I’m just trying to get out of bed in the morning. And pay my bills. And heal my broken heart. And find some sort of purpose in the world. Flight? 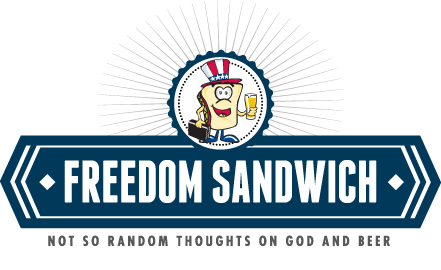 Transcendent freedom? I’m just trying to breathe. A lesson from movie musicals is that all goes well…until it doesn’t. But if you are reading this post right now, it means you are a living, breathing human being. Your movie isn’t finished. The end of your story is not written yet. And maybe, just maybe, there is something better ahead. A freedom you’ve never known. A time when all your needs are met. A person to fly with. A place to reach your full potential. A song. Your song. A dance in the clouds. May you breathe until you can sing. Walk until you can run. And dance until you can fly. Amen.